Grills and optional finishes are available. Call us for pricing! The Studio Electric M4 is a 12”x8.625"x15" sealed two-way monitor loudspeaker. The driver complement is a 6.5” proprietary co-polymer woofer, and 1” silk dome tweeter. 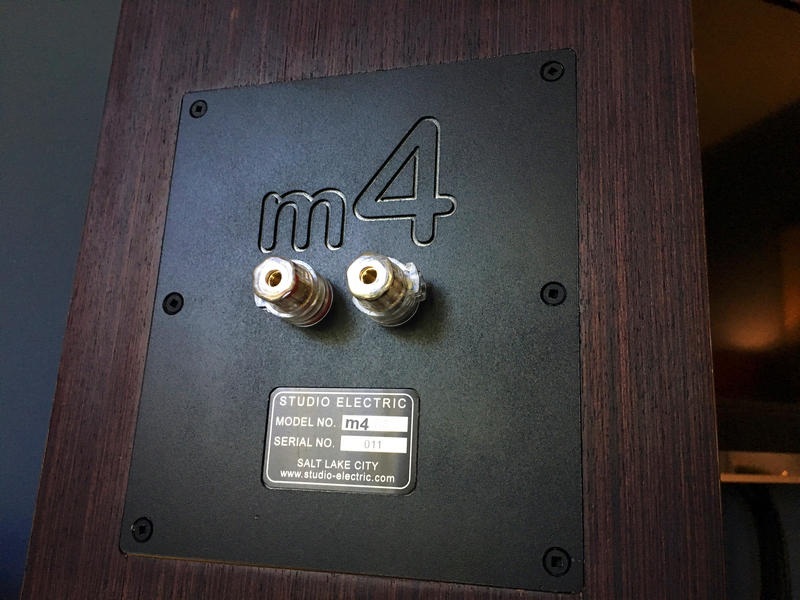 Around back, each monitor has a single pair of sturdy five-way binding posts mounted on a milled aluminum plate embossed with the M4 logo. The enclosure is a hefty mixture of high-density fiberboard, medium-density fiberboard, and sturdy bracing. Rot the Stock version M4, the front baffle is satin black, the sides and rear are wrapped in a beautiful, recycled real-wo-d wenge veneer (wood veneer options vary upon ordering). Yes you can order other veneers at an extra charge, and yes you can order them with grills, again at an additional charge. Below is an excerpt from what I consider a very accurate and well written review in Part Time Audiophile. I don't like to carry loudspeakers. Logistically they are expensive to ship on auditions, the market segment is crowded with manufacturers and hyperbole (what high end audio segment isn't these days?) and there is just too much confusion when it comes to making purchasing decisions. But once in awhile, logic flies out the window and I fall in love. Such is the case with the Studio Electric M4 Monitor. Dave MacPherson, managing partner at Studio Electric, has a 30-year history designing and building speaker systems for professional and home use. 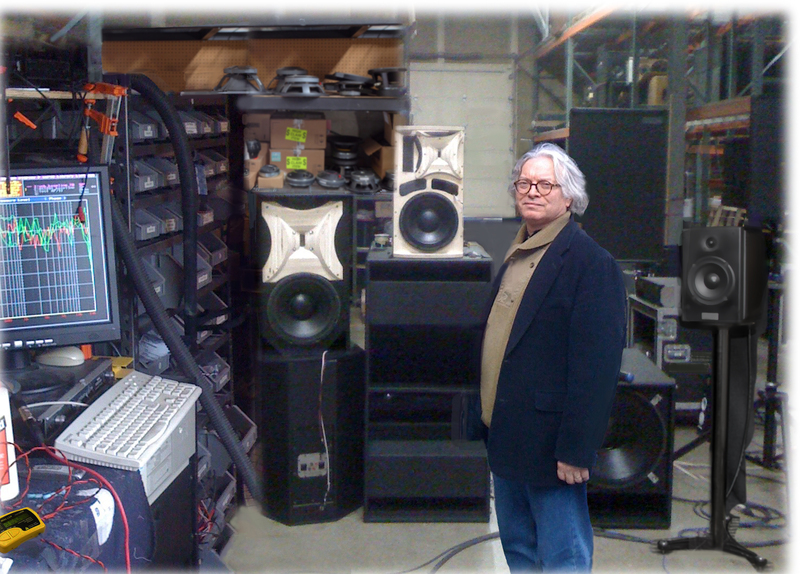 Thousands of loudspeakers designed by Dave are in service around the world. Located in Utah (home of another highly regarded speaker manufacturer) Dave and company make a wide range of loudspeakers from the M4 to a 2 1/2 way floor stander called the FSX. His approach to design is somewhat unique, and borne of his 30 years spent designing loudspeakers for live music reproduction in concert halls and studios. The results of his designs are magic. Fun to listen to - Studio Electric employs modern computer aided measurement tools to insure acurate reproduction, but the final decision on speaker voicing is always based on subjective listening with a core question: "Are we feeling an emotional connection to the music, or are we just listening to audio equipment?" 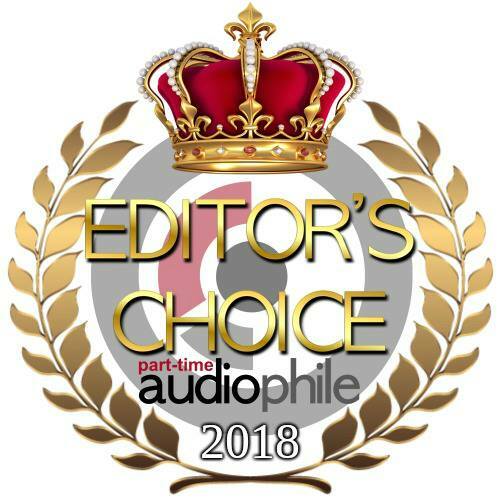 High value - Studio Electric loudspeakers are often included in audio show reports on "favorite systems" lists. Many owners report that their SE speakers exceed the performance of their previous reference speaker. Based on this positive feedback, we confidently invite comparison to systems costing much more. 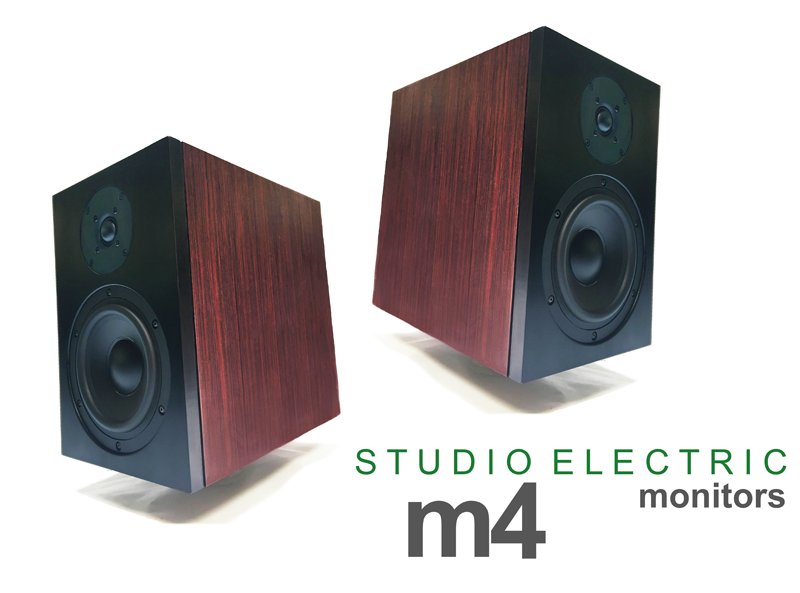 The M4 is a sealed box two way design that incorporates the same drive units as his more expensive speakers, just fewer of them and in a smaller cabinet. You rarely see a sealed box 2 way any longer. Why? Most designers try to squeeze out as much bass as possible from smaller speakers, and therefore result to porting the box in order to boost the bass output at lower frequencies. The tradeoff of this bass boost is that the port is quite reactive to room placement. Too close to a back or side wall and you can get tubby, boomy, one note bass. A sealed box design is less reactive, partly because of no port, but also partly because of the smoother roloff of low frequencies. In the illustration above, the green line represents a typical ported design. This creates an illusion of more bass output, but can also muddy the sound. Weight: 19 lbs. / 8.5 kg (shipped two per carton) @ 43 lbs. Click the button below to add the Studio Electric M4 Monitor - $2400 Per Pair to your wish list.